The latest scientific research revealed in Jane Mara’s new book – Think like an entrepreneur – the mindset of success, demonstrates that entrepreneurial thinking can be easily developed by everyone. It is far more than just creative thinking, idea generation or brain-storming techniques. What is less known is how their internal process develops their mindset to perform at the highest level. And it is much more than their ability to tolerate such things as high risk or failure. The entrepreneur develops their personal mindset from an inner perspective, they trust that clarity will emerge from intuition to inform the initial idea or vision for a business. "This intuition is beyond the brain, it appears in the heart, gut and internal organs. This formula has never been revealed outside the academic world. 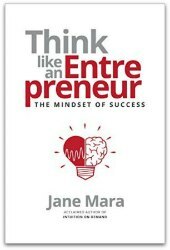 Through interviews with scientists, serial entrepreneurs and business thinkers about their individual experiences and with proven application and techniques, Jane Mara has unlocked the key to what makes serial entrepreneurs successful. Think like an entrepreneur – the mindset of success demystifies how serial entrepreneurs behave and what it takes to create successful business ventures. Importantly her research has focused on seeking an understanding of how successful repeat entrepreneurs integrate intuition and intentionality into recognising opportunities for business innovation and development. Jane has proven that this formula is accessible for all who wish to adopt more entrepreneurial thinking. Jane is an author, speaker, researcher, management trainer and executive coach applying the power of personal mindset to create success for organisations and individuals. She has strong business experience as a management consultant and is highly regarded for dissemination of complex scientific knowledge into practical applications for business. Read more.